I had a bit of time this past weekend, so it was decided it was a perfect opportunity to preserve some of the fantastic veggies we are seeing at the farmer’s market. My mom and I sat down and read through it arguing about what was in season and what we’d like to eat. We finally came to an agreement: pickled beets. Our next order of business was to locate a beet source. 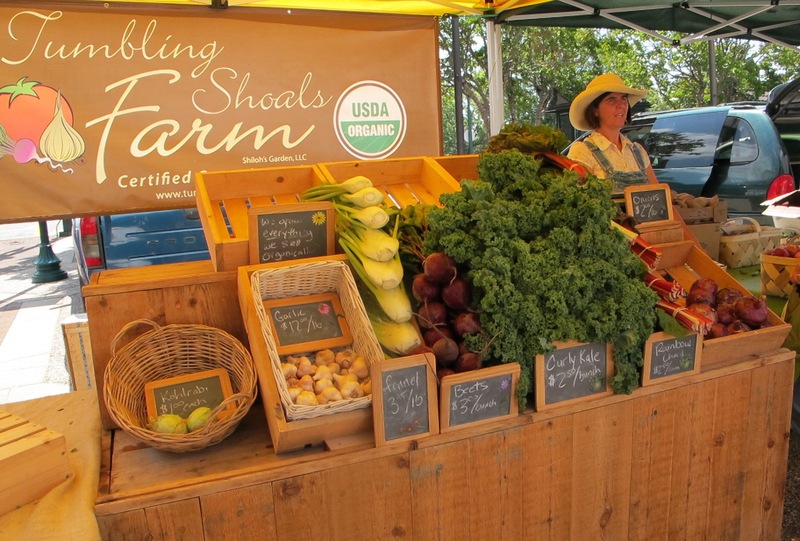 Thankfully we have a fantastic local organic farm that sells at the Hickory farmer’s market. 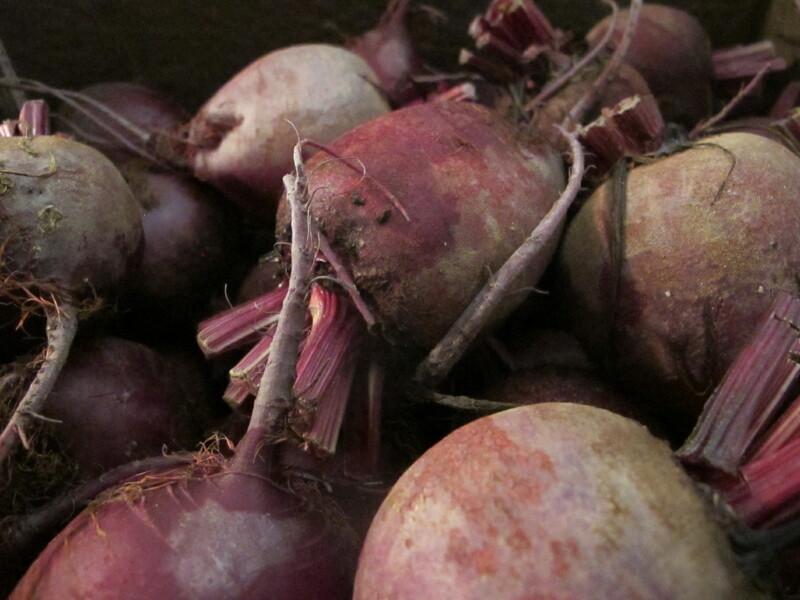 My parents participate in Tumbling Shoal’s CSA so mom called Shiloh and requested a case of beets. On Saturday morning we made our way to the market to pick up our 15 lbs (!!) of beautiful, organic beets. They arrived greens-free (one less step for us), but definitely needed some cleaning. While the beets were soaking in some cool water we grabbed the remainder of the ingredients needed. As promised on the cover of the magazine, it really is an easy recipe. 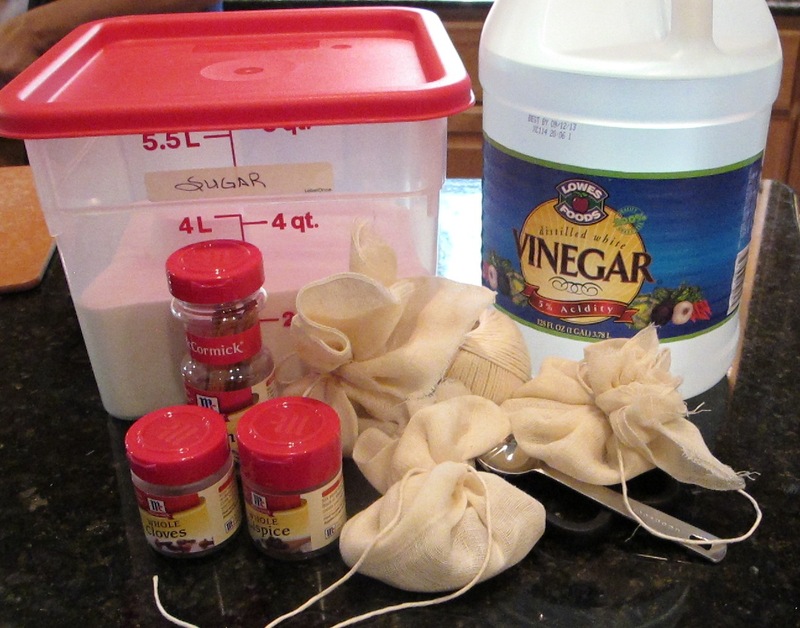 Vinegar, water, and sugar are cooked down slightly to form the syrup and pickling spices (cloves, cinnamon, and all spice) are wrapped in cheese cloth and dropped in the pot while cooking. The syrup takes less than 10 minutes total. After soaking, I scrubbed the beets a bit to remove most of the dirt then dropped them into a rather large pot of boiling water. The beets need to cook for 30 minutes or until tender. 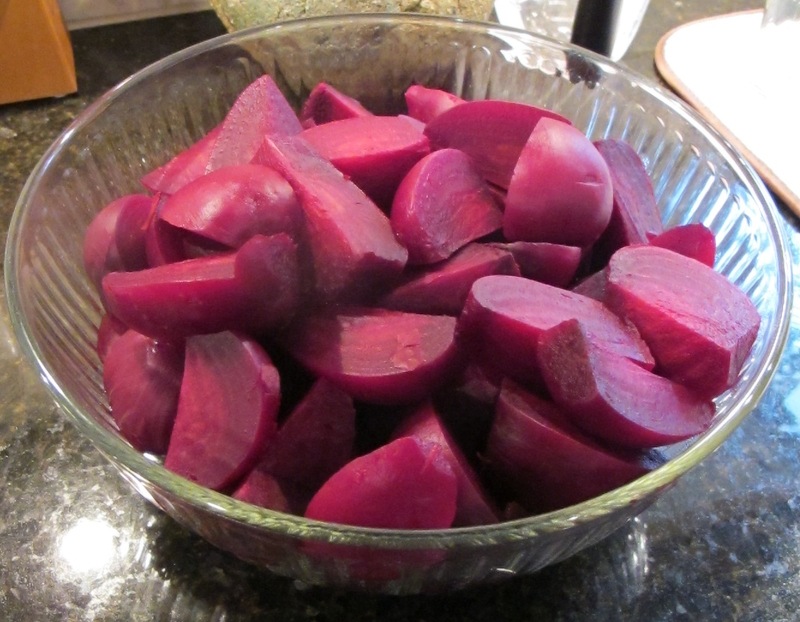 We had so many beets that we did this in two batches. Since the canner is so large, I filled it and started it while the beets were cooking. The hope is that it is at a rolling boil by the time you get around to adding jars. 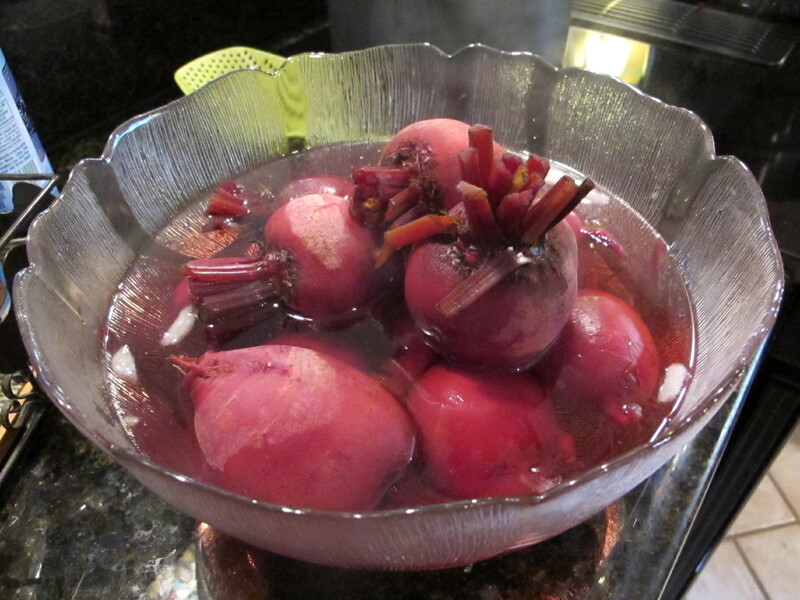 After cooking, I strained out the beets and dropped them into a bowl of ice water. Like with peaches and tomatoes, cooling them quickly loosens the skin and makes peeling a breeze. For beets, I highly recommend gloves and dark clothing. They are messy, and the juice definitely stains. Once they’ve cooled slightly, you can pick up an individual beet and using your fingers, pull the skin right off. After peeling, rinse them slightly to remove any ickiness that may still be present, cut out any bad spots, remove the top and bottom, and cut them into quarter pieces. 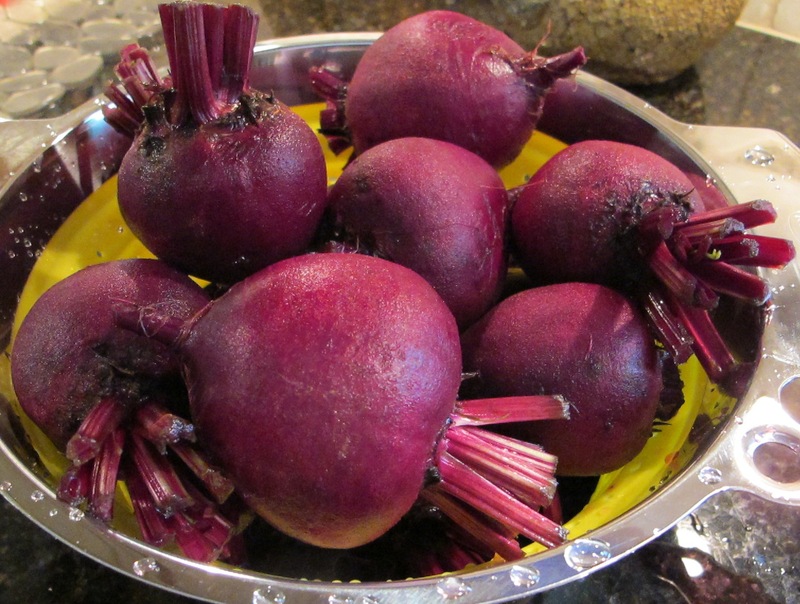 Depending on the size of the beets and the jar size you choose, you may have to cut them smaller. We started with the larger pieces below and realized quickly that half the size would be better option. We used half pint jars which is what the original recipe suggested. We found that filling the jars was easiest by hand (keep the gloves on for this part as well!). We simply picked up the beets and drop them in the jar, using our fingers to ensure as little space in the jar as possible. 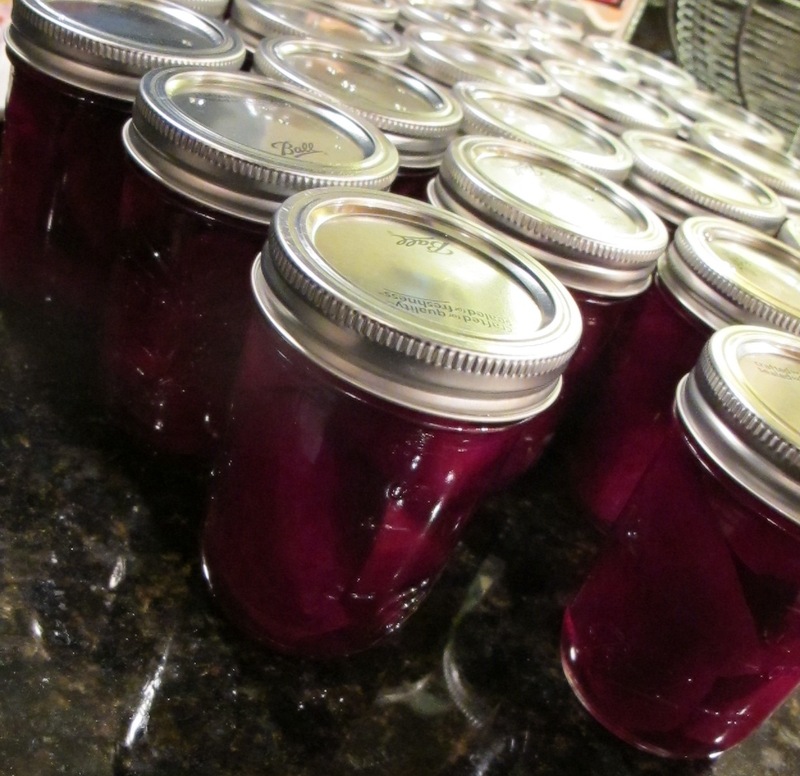 After filling each jar, we ladled the hot pickling syrup over the beets leaving 1/4 – 1/2″ head space. We then wiped each rim carefully with a clean, damp rag, then added the lid and band. It’s important to make sure your band in on firmly, but not overly tight. And into the canner they go. 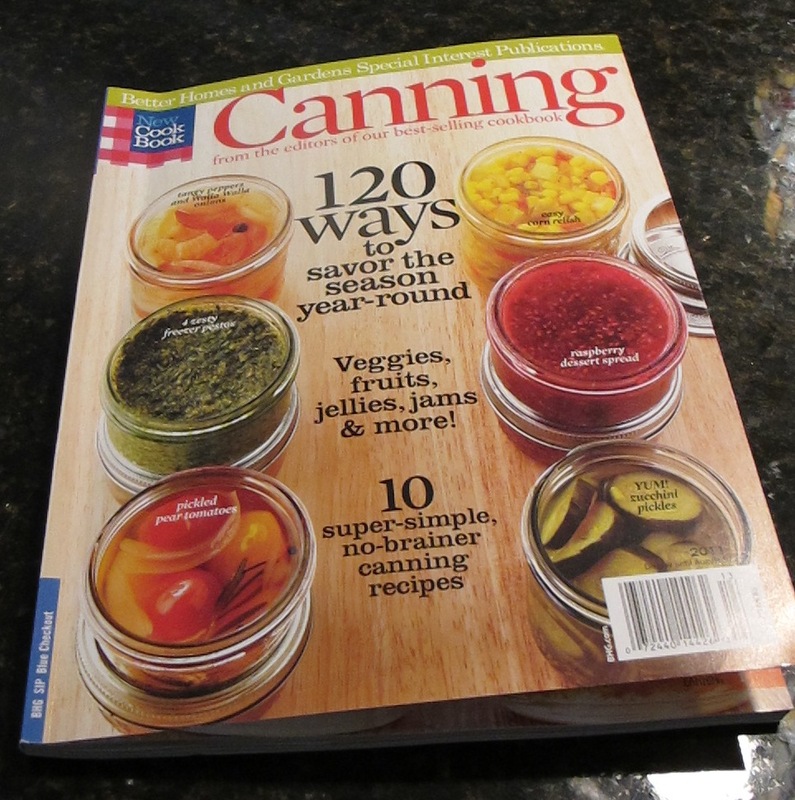 I always prop the rack on the outside of the canner to fill and then use my fingers to carefully lower it back in. This is easy the first time, but by the second batch the metal is quite hot, so do be careful. 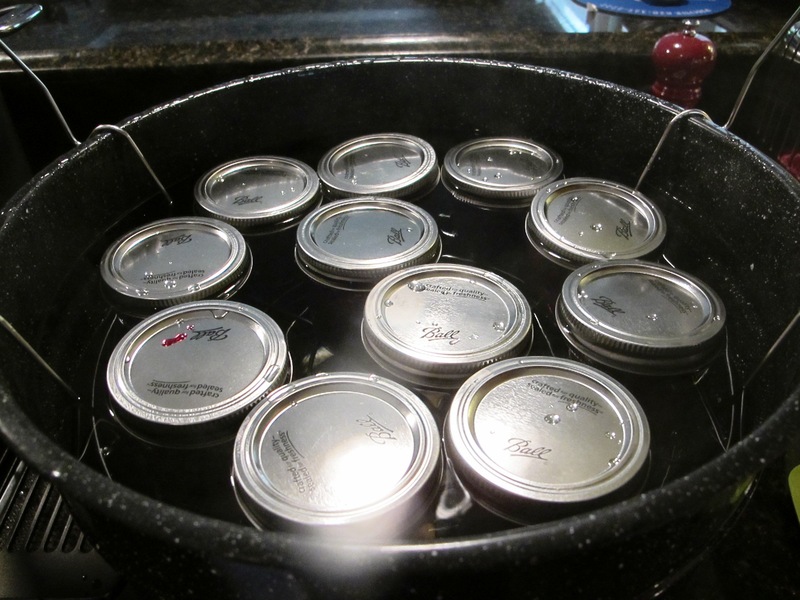 When you open the canner to add the jars, it will often stop boiling. It’s important to start the processing time only when the canner has returned to a rolling boil. 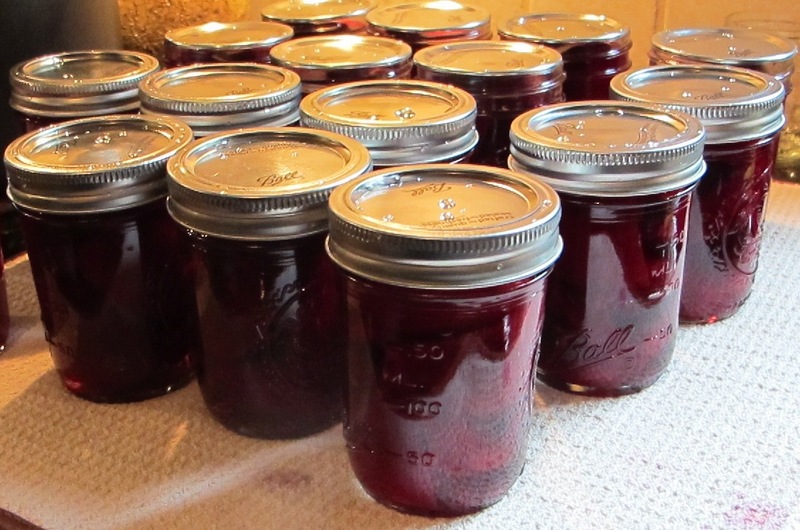 Each batch of beets were processed for 30 minutes in the canner. We had so many beets (and so many jars) that we did three separate batches. When each batch finishes, I use tongs to lift the canning rack (keeping it as even as possible), and prop it again on the side of the canner. This is a talent that I have not yet perfected. Beware of splashes of boiling water…not fun. Once the rack is up, the rest is easy. I bought jar lifters ages ago that I love (they are cheap too! ), and I use them to lift out each individual jar. Some recipes tell you cool on a wire rack. I find that a folded towel on the counter works just as well. The jars should sit undisturbed overnight. The next morning carefully check each seal by pressing down on the middle of the jar top. You shouldn’t feel any give and definitely should not hear any popping. Anything jars that move/pop at this point should be put in the fridge and consumed soon. For the others, you want to re-tighted your bands (they loosen slightly during processing), write the date and contents on the top of the jar or on a label, and put them in a cool, dark place for storage.